Last night was the coldest I've had on the trip, I had my sleeping bag zipped up and the hood pulled down well over my head. The morning remained chilled. 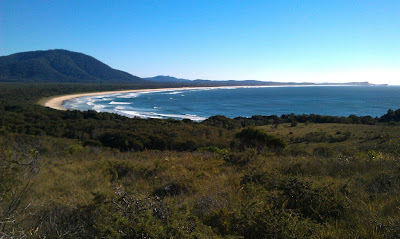 I contemplated going for another surf but we had a big days walk ahead of us so we headed off early. We left the Diamond Head walk-in campground via the office to pay for the nights site and met Al the campground manager. Al was another of the many kindly souls I've met who said he thought I was nuts but waived the camp fees with rueful smiles and wished us well. Mikey and I had some of the most spectacular scenery of the trip walking over Diamond Head to Indian Head then down to Kylie's Beach. 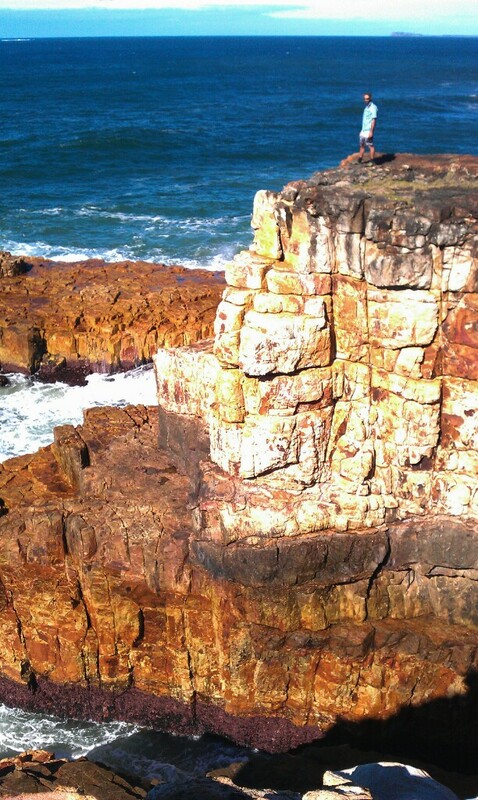 The headland is over 100 meters at its highest and has some very spectacular cliffs plummeting into the sea. We had our last look north at the sweeping curve of Dunbogan Beach and North Brother cradling it. 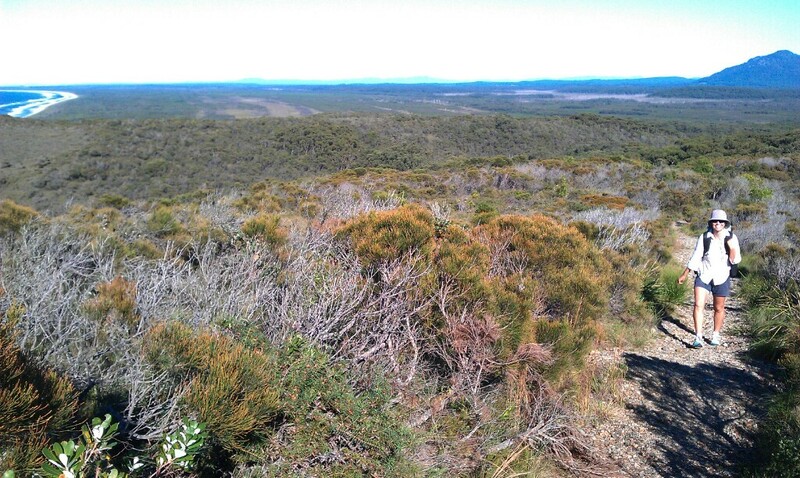 Then we had our first look at the far distant hills above Forster. 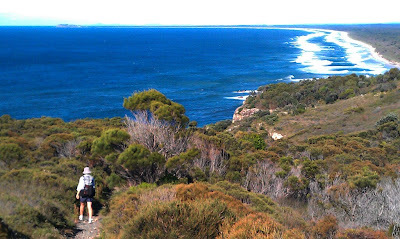 Between us and Foster was several days of beach walking including the longest single beach so far, Kylie's Beach running 18km to Crowdy Head. We walked down a steep ridge from the height of Diamond Head to one of the natural rock arches. 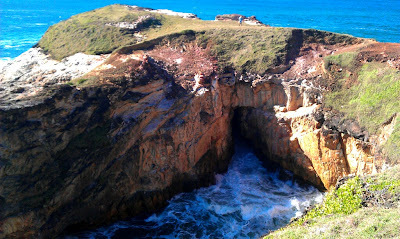 There was a surging swell creating water spouts through the rock. A strong south westerly wind added to the excitement and the salt spray. We headed then down the path made by the hang glider flyers to get back up the cliff from Kylie's Beach. 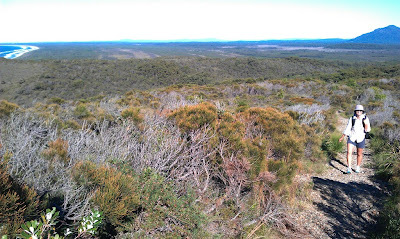 Kylie Tennant was a prolific author and journalist who spent a lot of time exploring this area in the 1940's. 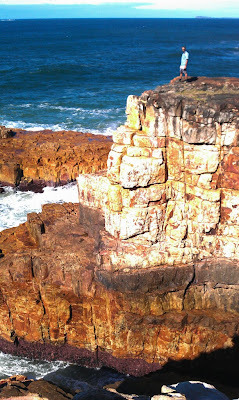 She wrote a book called The Man on the Headland inspired by the then owner of the land Ernie Metcalfe. 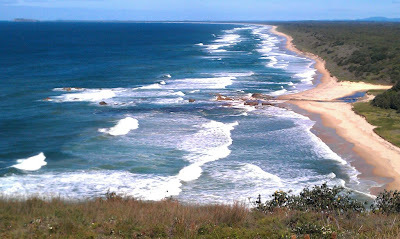 Almost everything on the southern side of the headland is named after her including the long beach to Crowdy Head. In the photo of Kylie's Beach above you can see Crowdy Head dimly in the upper left corner, a long walk. 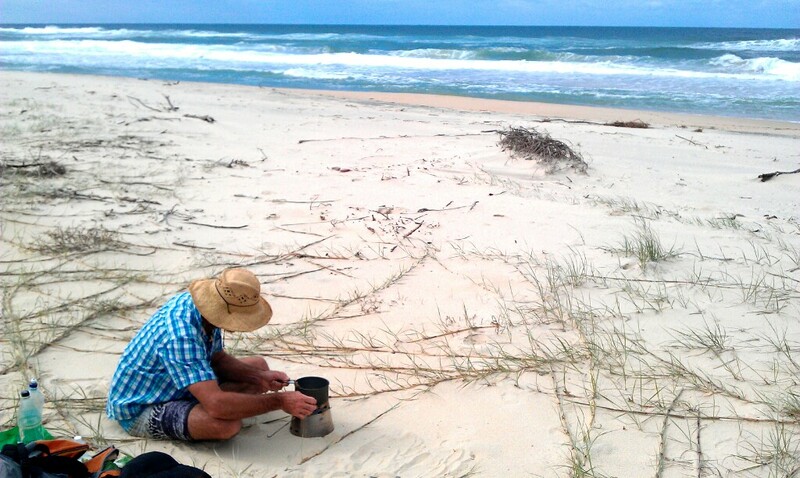 We set off as the tide was still rising but conceded pretty quickly to the soft sinking sand. We sat at the back of the beach out of the wind and cooked lunch on our metho burner and waited for the tide to turn. We had not just lentils but for entree we fried holummi cheese, the best haloumi I've ever had! It took us a good many hours to inch our way toward Crowdy Head but the distance gave us time to sink into a rhythm and a quiet ease. 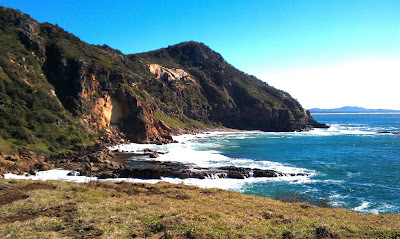 We camped in the national park campground a couple of kilometers from Crowdy Head. Tired but satisfied!